The V@mp VP325 | OhGizmo! The Holidays are coming. You know that, right? Now, I’m sure that if you think hard enough, you’ll realize you’ve got some kid in your life who’s constantly lusting after all your gadgets. He plays with them, presses all the buttons, while you hold your breath and smile politely. Now, you could buy that kid some phony Fisher Price piece of crap simili-gadget. But kids are smart, man. They’ll see right through it. 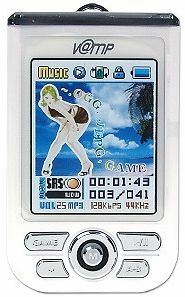 So, be nice, and shell out a very reasonable $50 to purchase this: the [email protected] 256MB MP3 Player. With that, he’ll be the coolest nine year old in class, and he’ll adore you forever. Or, maybe he’ll curse you and kick you in the shin for not buying him a nano instead. Who knows with kids these days. Check out the product page. And, a place to buy it. Story VIA DAPreview. I love the great translation on the Operating System page. Why donâ€™t you give us your URL for your successful global business? We are all holding our breath for more of verbal diarrhea.